Disaster! My computer hard drive fried! It just suddenly quit and there was nothing I could do to rescue the things that were on it. I'd backed up most of the important things a week before the crash but some emails, were lost. So if you wrote me and didn't get answer, please write again. I've been madly trying to finish the latest---and maybe the last---Selby book, Selby Sprung. When my computer crashed, I lost the latest changes to the stories but, fortunately, Selby rang me and helped me get the stories right. So no Selby stories were lost. I should have the book finished soon. One thing that Selby refuses to tell me is why he wanted the book to be called Selby Sprung. Did he really get sprung? Did people find out his secret? He said that he'd tell me that last story just before the book is published. I can't wait to hear about it! Australia has some of the most beautiful birds in the world. These are rainbow lorikeets and they're very common here in Sydney. And they're not shy. This group let me get very close to them to take this picture. Every year in November the suburb of Glebe in Sydney has a street fair. The whole of Glebe Point Road is jammed with people listening to bands, buying wonderful food and clothing from street stalls. 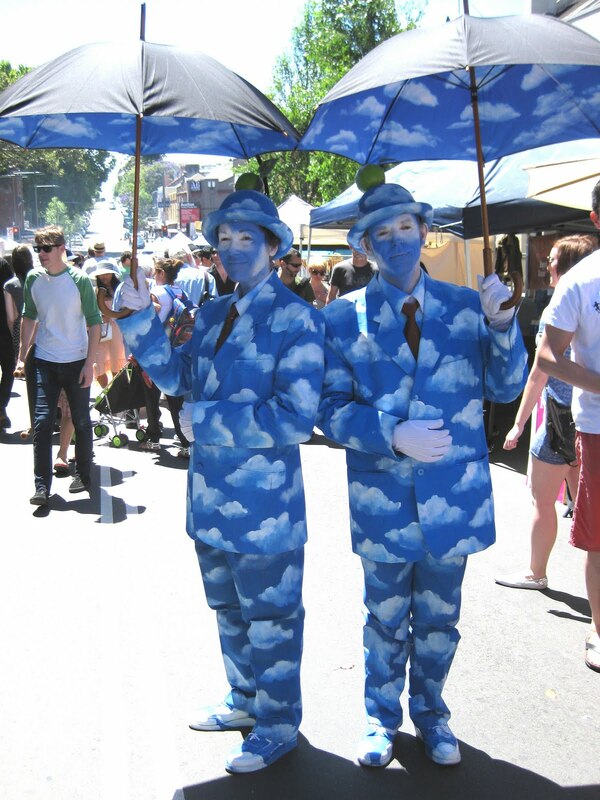 Here are a couple of people with their clothes painted to look like the sky. The New South Wales Premier's Reading Challenge is a program to get kids reading lots of books. 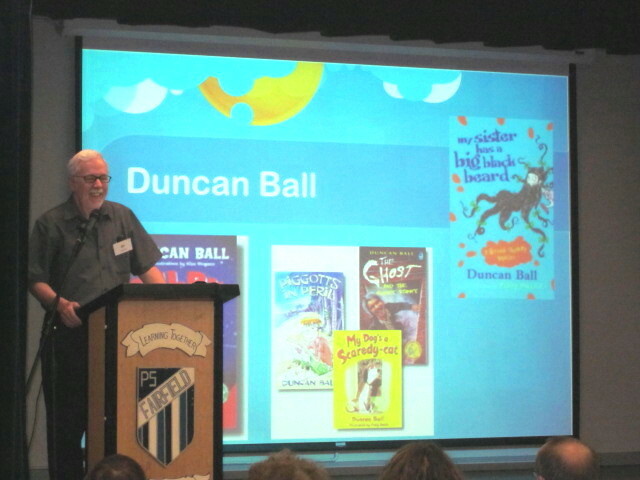 A number of my books are on their reading list so I was invited along to the launch of the program. Here's a picture of me, Selby and Snow White at the launch. I hope you had a good break and that you have a great 2011. And happy Chinese New Year! Much has happened between my last blog entry and now, so much that it's hard to remember everything. One of the more memorable events was the KOALA (Kids' Own Australian Literature Awards) ceremony. Here I am talking at the awards ceremony. Most of my time recently has been taken up in writing the 16th Selby book, Selby Sprung. The book was almost finished when I suddenly had an eye problem and needed an operation. That was last week and I'm still recovering but I'll be back to normal soon and working on the last bits of the Selby book. Selby hasn't told me his final adventure yet. He said he was going to wait and tell me at the very last minute. I'm worried that it might mean he's about to give away his secret. I guess I'll just have to wait and see. Or maybe he knows that he's about to be found out. Maybe the Search for Selby Society is about to spring him. Come to think of it, maybe that's why he wants me to call the book Selby Sprung. Just now I'm waiting for the weather to change into something that's bearable. But although it's been incredibly hot in Sydney we haven't had the floods and cyclones that Victoria and Queensland have had to deal with.